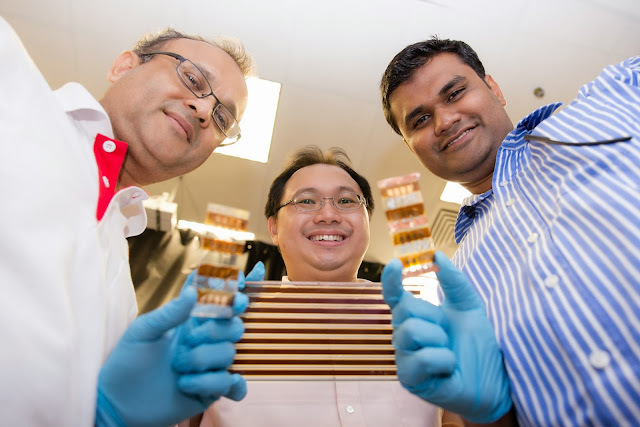 Prof Subodh Mhaisalkar (left) and Dr Nripan Mathews (right) are holding the new Perosvkite solar cells made in NTU labs and hopes to develop into a solar cell module, as held by Prof Sum Tze Chien (centre). "In our work, we utilise ultrafast lasers to study the perovskite materials. We tracked how fast these materials react to light in quadrillionths of a second (roughly 100 billion times faster than a camera flash)," said the Singaporean photophysics expert from NTU's School of Physical and Mathematical Sciences. "Now that we know exactly how perovskite materials behave and work, we will be able to tweak the performance of the new solar cells and improve its efficiency, hopefully reaching or even exceeding the performance of today's thin-film solar cells," said Dr Mathews, who is also the Singapore R&D Director of the Singapore-Berkeley Research Initiative for Sustainable Energy (SinBeRISE) NRF CREATE programme. "Perovskite-based solar cells have the potential to reach 20 per cent solar cell efficiencies and another great benefit of these materials is their amenability to yield different translucent colours, such as red, yellow or brown. Having such colourful solar glass will create new opportunities for architectural design," he added. Long-Range Balanced Electron- and Hole-Transport Lengths in Organic-Inorganic CH3NH3PbI3, Science 18 October 2013: vol. 342 no. 6156 344-347.